The SS Reichsfürher Heinrich Himmler, on the 23rd of September 1940 gave the SS doctors orders to collect the golden teeth in the mouth of the dead. Everybody knows that. But, who knows who were the SS dentists directly implicated in that collection, the real figures, how Nazis proceeded? Here are the answers. For the first time. - The SS Reichsfürher Heinrich Himmler, on the 23rd of September 1940 gave the SS doctors orders to collect the golden teeth in the mouth of the dead, and also "the golden teeth that cannot be repaired", from the mouth of the people alive. This decree, that was part of the T4 Operation, was not systematically put into practice on the concentration camps prisoners. - Himmler decrees that collection of dental gold should be systematic, in a second decree, on December the 23rd 1942. This measure directly results from the concrete organisation of the Final Solution. It was enforced in order to get enough money to buy raw materials . Referring to: local decree DI/1 14 c 9/Ot J. For the attention of the commandants of the concentration camps of Dachau, Sachsenhausen, Buchenwald, Mauthausen, Flossenbürg, Neuengamme, Auschwitz, Gross-Rosen, Natzweiler, Niederhagen, Stutthof, Herungen, ravensbrück and of the prisoners of war camp of Lublin. A copy is sent to the chief of the DIII office in this concentration camp. In addition to this decree, it is ordered that small concentration camps send dental gold collected after a whole year, and not small quantities every month as it has been the case very recently. Chief of the central office SS-Obersturmbannfürer Liebehenschel . For the attention of the commandants of the concentration camps of Dachau, Sachsenhausen, Buchenwald, Mauthausen, Flossenbürg, Neuengamme, Auschwitz, Gross-Rosen, Natzweiler, Riga, Stutthof, Lublin, Ravensbrück, Herzungen, ? and Bergen-Belsen. "….. died in this camp, the corpse has been cremated on the….., which makes it impossible for us to send you back the dental gold." - Gold reserves were taken by force in each of the countries conquered. - The Jews were stripped of their rights. 1/ The precious metal is buried with the body and remains there for 30 or 60 years or more and, when exhumed in order to be moved to a new resting place, it will perhaps be found. It is neither the heirs nor the community who benefit from the gold but the governing body of the Church or the cemetery which removes it, if not already pocketed by gravediggers. It may also be the case that it remains undergound, lost as part of the national heritage. 3/ If the inheritors are in agreement and wish to take it for themselves, the precious metal can be removed prior to burial or cremation by a specialist. It would be conceivable that the State could do this systematically and quite lawfully. Perhaps whilst reclaiming the metal for the State, inheritors are in receipt of compensation or it is suggested that a donation is made to the community, the amount never of any significance. 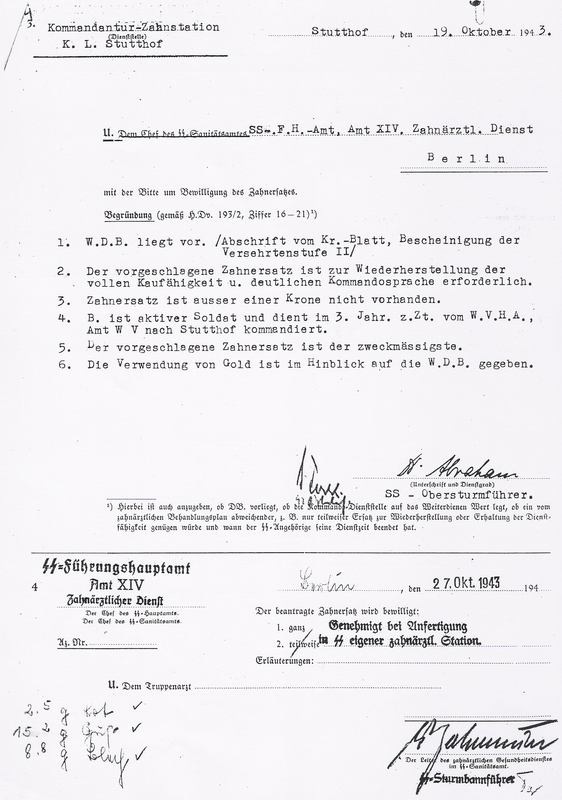 September 1st 1939: Hitler signed a backdated order, thus becoming a wartime measure, which authorised the extermination of the mentally ill and the physically disabled (Aktion T4). The process which was used was gassing. Gold teeth, which were collected in all the extermination centers straight after the gas chambers, served to finance a part of the action. The 1st action which was carried out was in Brandenburg in 1940. SS dentists had to improve their skills by learning how to extract dental gold from the inmates' mouths, whether they were insane or not, along with their race hygiene training courses in universities. One dental surgery in each big concentration camp. The SS dentist works under the general doctor of the camp's command. Dental gold (taken from dead prisoners) is used to treat the officers. Basic treatments for the soldiers. Dr Helmut Johannsenn  (28/01/1908-?) belongs to the service XIV of dental department of SS-FHA services D. He was responsible for placing the SS dentists in the front and in the concentration camps. Not more than 100 SS dentists worked in concentration camps. I found 60 of them. 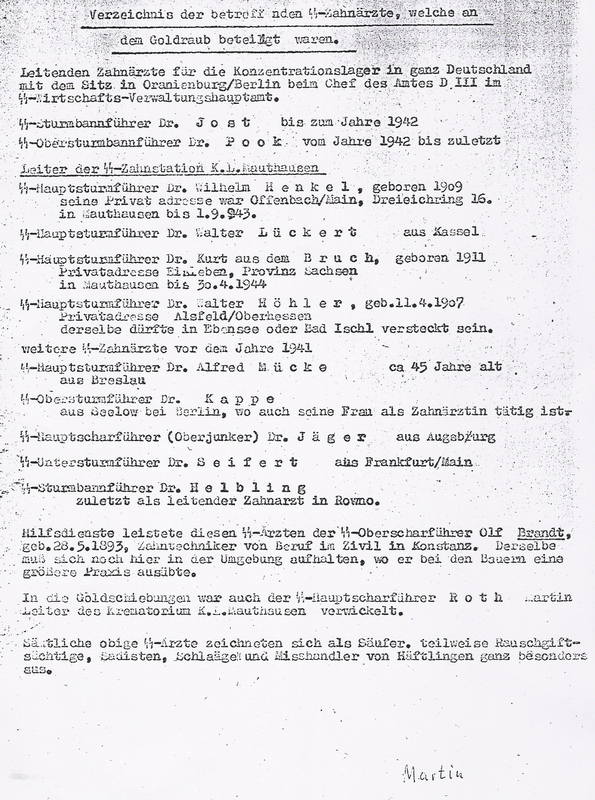 From what I know, 7 dentists were condemned for war crimes and crimes against humanity: Pr Hugo Blaschke (10 years imprisonment); Dr Hermann Pook (10 years imprisonment); Dr Willy Frank (7 years imprisonment); Dr Karl-Heinz Tauber, first dentist of Auschwitz before Willy Frank (6 years imprisonment); Dr Karl Philipp Teodor Schütz, dentist in Lublin- Majdanek (at least 3 months imprisonment); Dr Wilhelm Henkel, sentenced to death for murders in Mauthausen, executed May 28th ,1947; Dr Walter Sonntag, sentenced to death for murders in Ravensbrück, executed September 17th,1948. Dr Willi Schatz, second dentist of Auschwitz, was judged and was found not guilty. 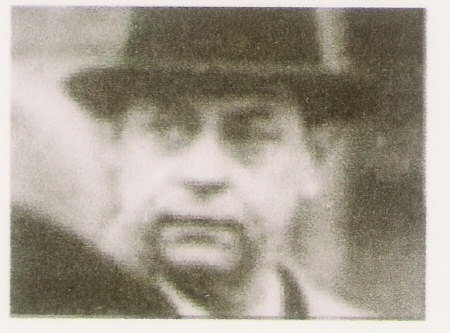 Dr Walter Bremmer, dentist in Flossenbürg, was judged after the war. Was he condemned? I don't know. From the University Dental Institute in Breslau. Supervised by the professor Dr Euler (on the middle). Upon arriving in the camps, a medical examination was performed. Gold teeth were extracted and their anthropometric descriptions were immediately written on the inmates' medical records or imprisonment cards. Later on, in some camps, when the inmates were still alive, their crowns were also extracted from their mouths. In other camps, once the inmates were dead, the gold was also collected before they were cremated. The bodies were marked with a blue cross or with a short thread tied on a toe. A receipt was written for each inmate detailing what had been extracted. Each month, once the gold was collected and sent, a receipt which indicated the weight of the recovered gold was enclosed. 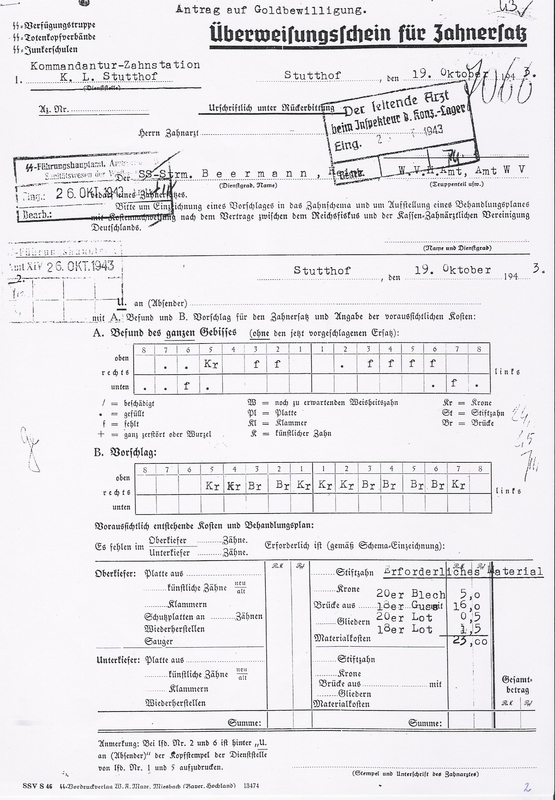 Pierre Schillio's medical record. He was taken to the infirmary of Dachau concentration camp, on August 6th 1944. 5th line of the symptomatological description: no metal tooth . 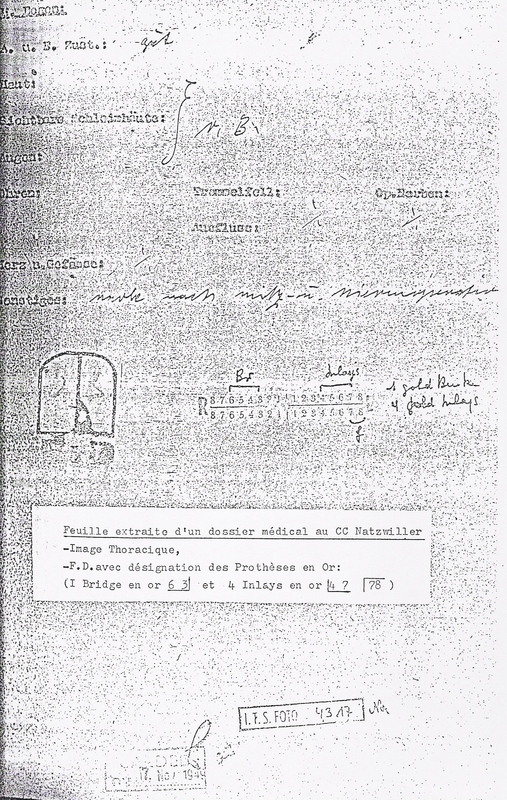 Page extracted from a medical file of Natzweiler-Struthof concentration camp. Odontogram with a gold bridge on the left of 4 teeth and 4 gold inlays on the right . 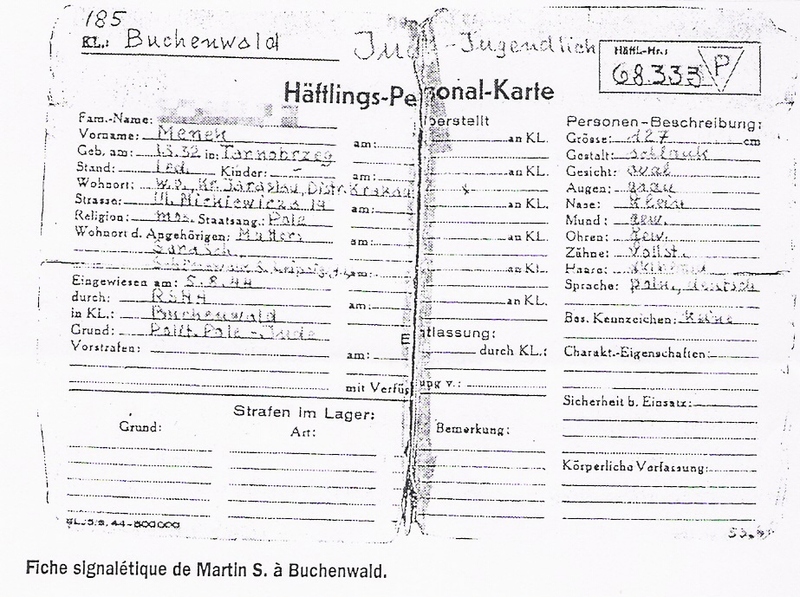 A inmate's medical record of Buchenwald concentration camp. On the right, the inmate's dentition had been detailed . 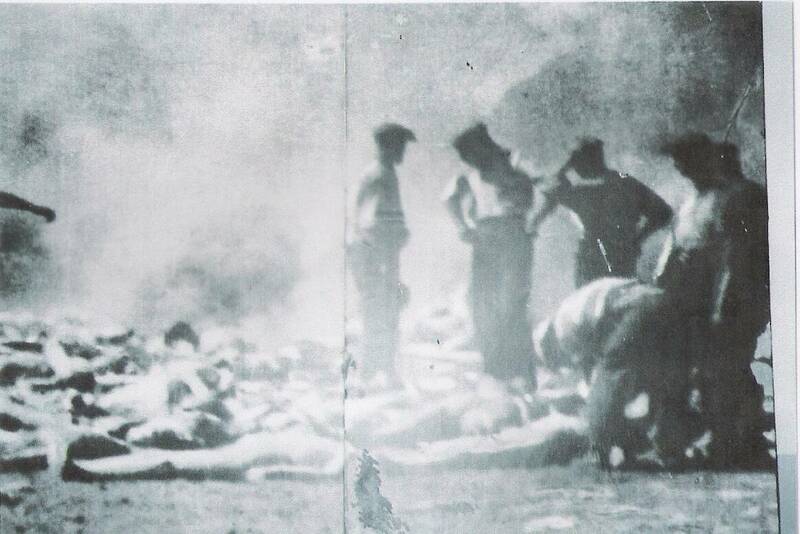 At Auschwitz concentration camp, straight after the gas chambers, a Sonderkommando team usually opened the dead's mouths and extracted all the metals they could get. A 1st team of 30 dentists/stomatologists had been selected for that reason in 1942. A Sonderkommando's lifetime = 3 months. Each team (8 men) alternately worked up to 12 hours. They often checked that no gold tooth had been forgotten after the extraction. Then the teeth were put in zinc buckets filled with sulfuric acid. A gold foundry was created in Crematorium III, at the end of 1943. Two Jewish dentists from Paris, Franz Feldmann de Trentschin Teplits and Paul Katz, were transfered from Auschwitz's dental centre to the crematoria of Birkenau concentration camp. Their quarter was located on the ground floor of Crematorium III. A sign which was hung at the door of their premises had an inscription in big letters formally banning any entry to the inmates and even to the SS. It was behind that door that were opened wooden cases filled with gold denture teeth which had belonged to the victims of gas chambers . The dentists often removed fragments of soft flesh and bones which were still attached to the gold teeth, by dipping them into hydrochloric acid. The metal was melted in graphite molds and shaped in bars of a given weight. Every fortnight, an ambulance came to take delivery of the collected gold. Thus, from 5 to 10kg were melted every day in the form of a 140-gram cylinder or of half a grapefruit. Some of the tinplate cans used to put the bridges, crowns or any other gold devices which had belonged to the gassed victims before they were cremated, were cans which formerly had contained Zyklon B gas. An ambulance came to take delivery of the collected gold every fortnight according to Filip Müller , a survivor of the Sonderkommandos (according to Myklos Nyiszli , another survivor of the Sonderkommandos, it was a SS officer who came every Friday to take delivery of the recovered gold). A receipt with the odontogram was written for each dead inmate detailing which teeth had been extracted. When they were sent to Berlin, a monthly receipt recapitulated the weight of dental gold which was thus sent [17,18]. The extraction of dental gold straight after a gas chamber at Auschwitz concentration camp . 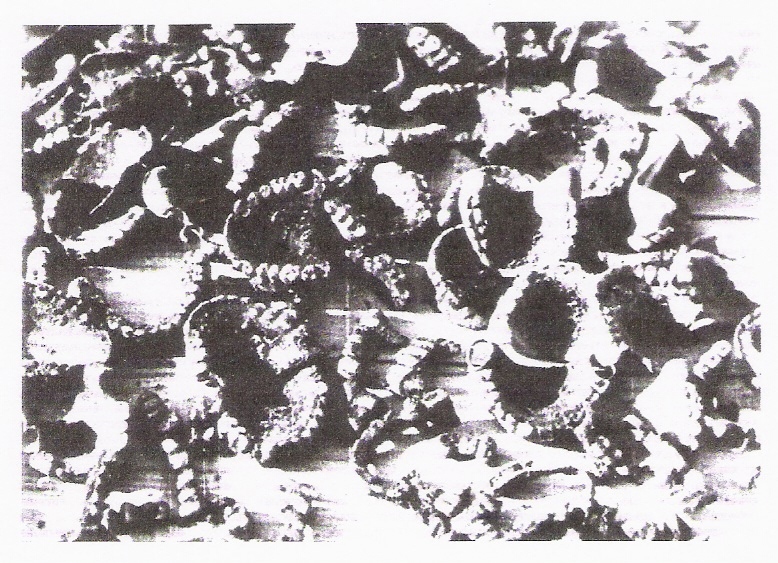 Dentures collected after the gas chambers at Auschwitz . Extraction forceps with which dental gold was recovered after the gas chambers at Auschwitz concentration camp . Examples of melted gold bars made from the dead inmates' gold teeth in the concentration camps . 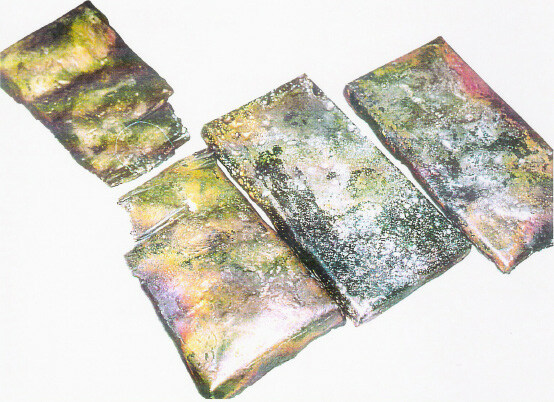 According to the inmate F. Feldmann, 2 000 kg of « material » were melted into bars between 1943 and Autumn 1944 in the foundry . Dr Willy Frank (09/02/1903- ? ), first dentist in Auschwitz . A monthly receipt from Auschwitz dating back to March 30th 1944 (12 grams of dental gold) . Wooden cases filled with gold teeth at Oranienburg-Sachsenhausen concentration camp (300 000 teeth for approximately 80 000 dead inmates) . After the liberation of Buchenwald concentration camp, expert jewellers examined the valuable items abandoned by the SS and especially, the gold teeth collected from the dead's mouths . Here are three death certificates: Jewish Bezabel Lichtenstein, inmate # 58001, died on November 28th 1944 Jewish Adolf Kohn inmate # 55390, died on November 30th 1944 Jewish Ernst Kirstein inmate # 55408, died on November 30th 1944 Two gold bridges, each made up of a crown and a tooth, and two gold crowns were extracted from inmate Kohn, Adolf by the inmates' doctor in the presence of SS-Sturmmann Raatz. To the commander of Stutthof concentration camp. Administration. For the inmate on the left, 1 gram of dental gold was collected on November 25th 1944. For the one in the middle, 1,6 grams on December 28th 1944 and for the one on the right, 1 gram of dental gold was extracted on December 28th 1944. 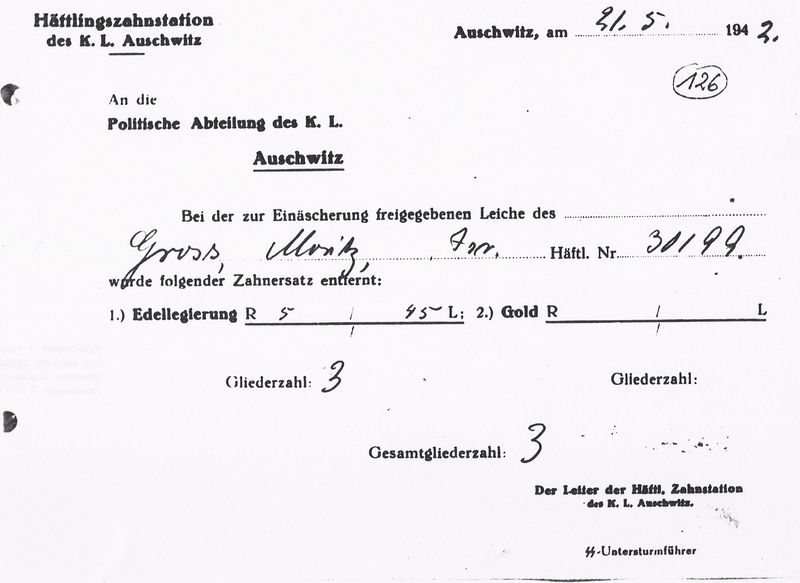 3 receipts of dental gold extraction for 3 dead inmates at Buchenwald concentration camp . Monthly receipt for dental gold recovery in Buchenwald concentration camp sent to the SS-WVHA in March 1944. For March 1944, 383,3 grams of dental gold were sent to the SS economy (SS-WVHA) of Berlin representing 61 dead inmates . What became of that gold? Trafficking between the deported or between the deported and the SS (gold in exchange of food): some did not hesitate to have their gold teeth extracted in exchange of food. - Thefts of gold by the SS. During the entry medical examination, the gold teeth were measured and then, extracted. 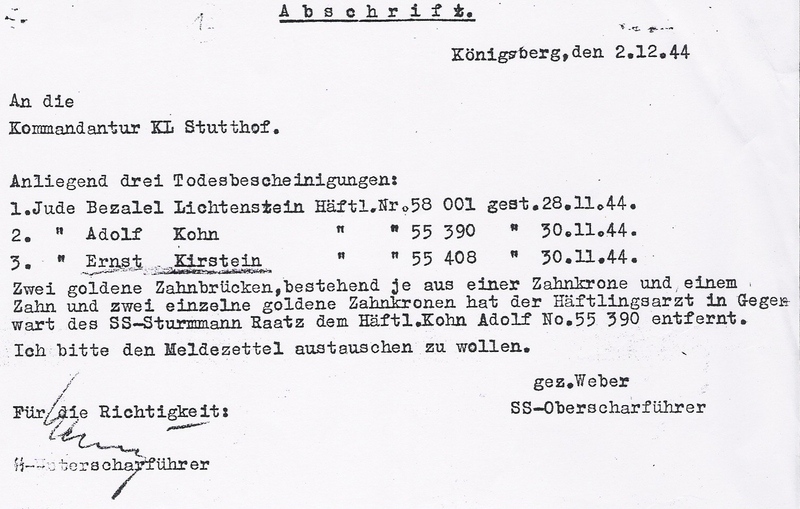 List of SS dentists who theft some dental gold in Mauthausen concentration camp . - Use for the SS officers' dental prostheses, as the soldiers were only entitled to dental treatment. 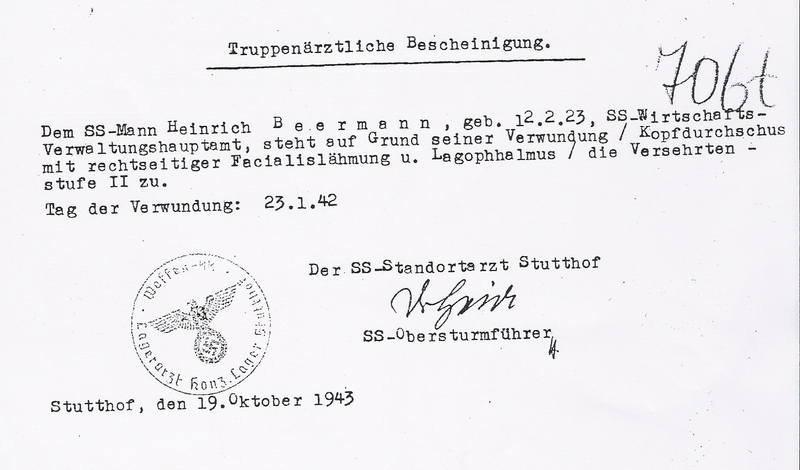 Medical certificate stating disability was granted to SS Heinrich Beermann, on January 23rd 1942, following a head injury . 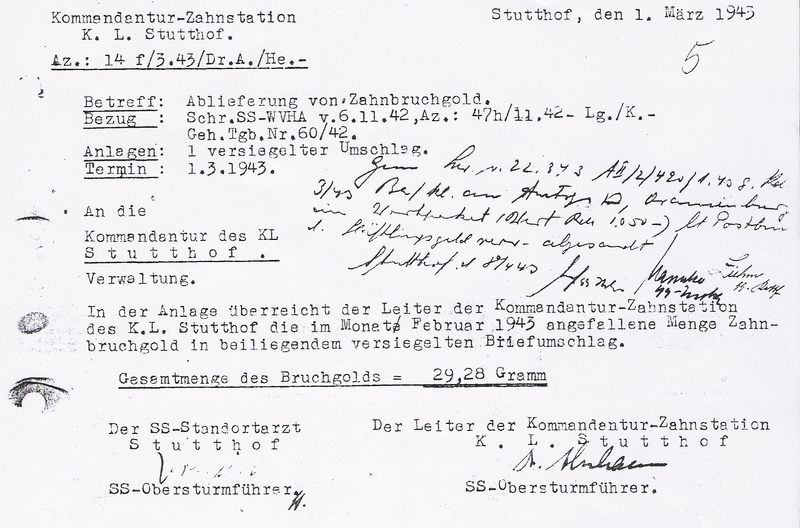 Dental gold demand for the SS officer Heinrich Beermann, endorsed by the head physician, on October 23rd 1943 and received by the SS-FHA on October 26th 1943. The weight of the needed dental gold and the odontogram (with the treatment plan) were provided to justify the request . 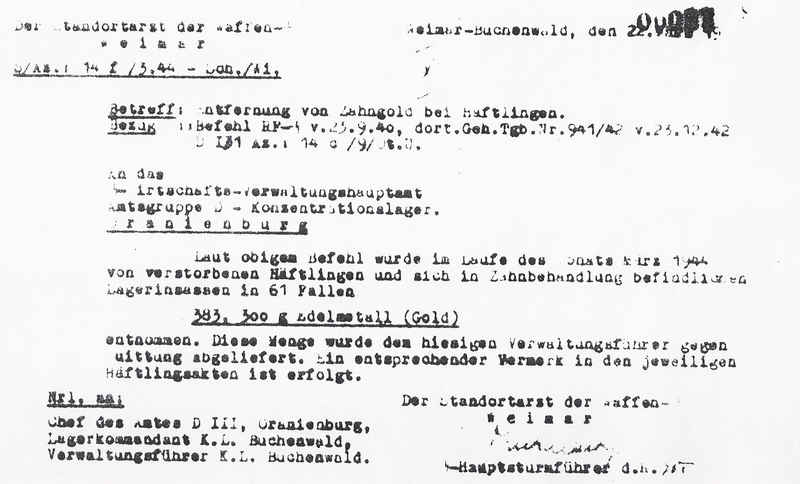 Agreement from the SS-FHA to allocate dental gold for the completion of SS Heinrich Beermann's dental prosthesis , dated October 27th 1943. - The gold was recovered, then was sent to the Reichsbank of Berlin. As you ordered, dental gold collected from the mouth of the dead in concentration camps is sent to the hygiene department. This service uses it to treat our men. SS-Oberführer Blaschke already has over 50 Kg of gold in stock: which represents enough gold for treatments during the next 5 years. I think it would be unwise to stock more gold in that same purpose, for security and profitability reasons. 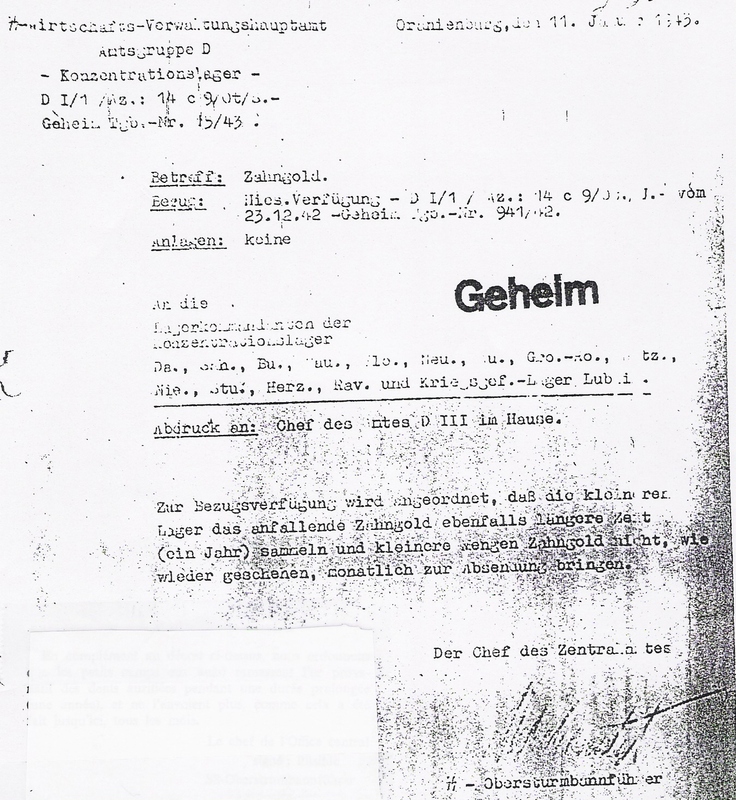 I therefore ask authorisation to send that gold, collected as a result of the normal losses in the camps, to the Reichsbank in return of a receipt. Pr Hugo Blaschke (1881- 1953) . Blaschke was in charge of all the dental service of the SS, and he was also the personnel dentist of Hitler, of Himmler, of Goering, of Eva Braun, among others. One of the dentures he made was very useful for the identification of the burned bodies of Hitler and Eva Braun. He was directly implicated in the organisation of the collection of the dental gold from the dead and using it for the dentures of SS soldiers. After the war, Blaschke was confined in Nuremberg. He was sentenced to 10 years of prison for war crimes and crimes against humanity. 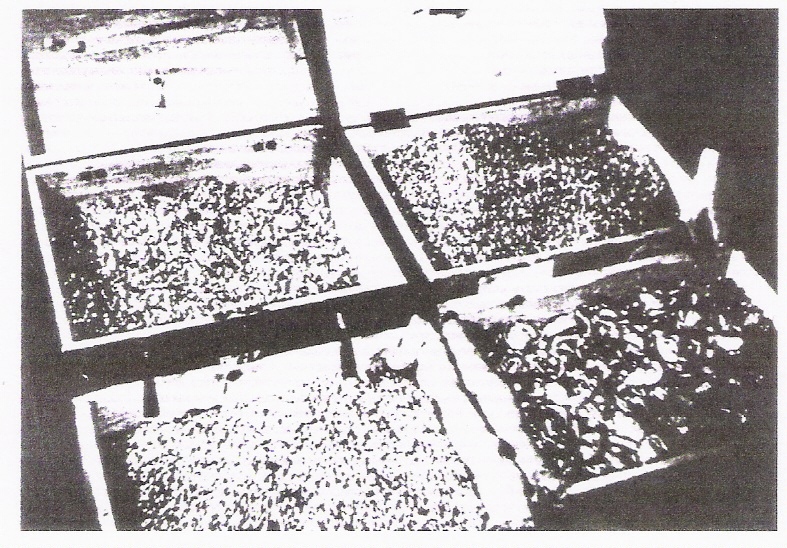 - From 100 to 500 grams of gold per month were collected throughout most of the war in Buchenwald. - 25 kg at Mauthausen concentration camp . - At the beginning of 1944, the members of the Resistance movement, which had developed among the inmates in Auschwitz concentration camp, noticed that the SS board of directors had collected from 10 to 12 kg of gold per month thanks to the victims' teeth resulting from mass extermination. In one of the secret notes which had been sent in June 1944 outside the camp, the previous month the SS was said to have collected 40 kg of gold and white metal from the teeth of Jewish inmates who had previously died in the camp. 6 000 kg of dental gold were collected for Auschwitz alone throughout most of the war. 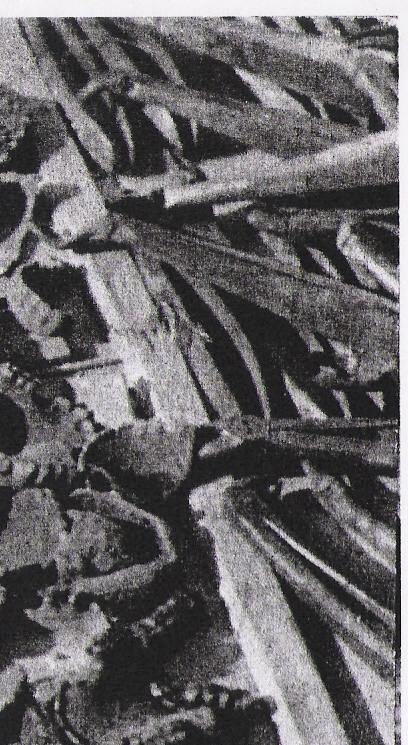 In 1945, upon a request made by the general commission in the investigation of Nazi crimes in Poland, the investigating judge Jan Sehn and the lawyer Edward Pechalski examined a set of documents of more than 2900 files of dental gold recovery following the execution of the inmates, at Auschwitz concentration camp . Those documents mainly concerned men and a few women. Those archives stretched from the second half of May to the beginning of December 1942, that is to say about 200 days. Therefore, over this period, 16 325 of gold teeth or precious metal alloys were collected from 2 904 dead inmates. An average of 5,62 collected teeth per individual. After having studied 237 similar files, I came up with a similar result (5,24 teeth per individual.). - Lublin/Majdanek concentration camp: 4 kg of gold for March and April 1944. - Treblinka extermination camp: 2 suitcases per week carrying from 8 to 10 kg of gold . - 30% of gold was said to have escaped the control of SS officers. - This figure should be treated with caution because nothing is certain regarding this last topic. In 1946 the dollar was worth 4.2 Swiss Francs. Dental gold at the time was worth: 22 carat gold (916.5 g of gold per 1000 g) containing platinum >> high value Gold no longer contains platinum but copper is added these days. 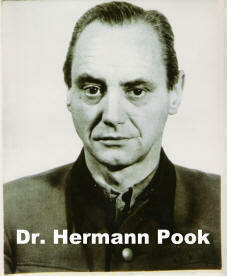 Dr Hermann Pook (1901-1983) . Heinrich Himmler organised the recovery of dental gold in a second decree in 1942 following on from the setting up of the Final Solution. 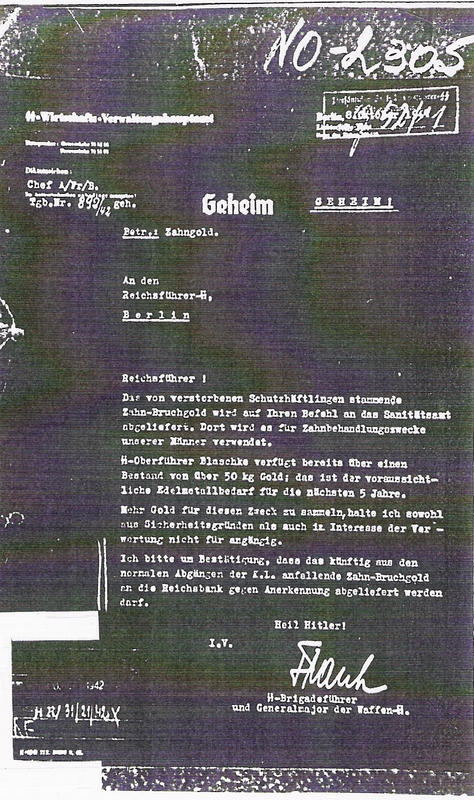 Gold was delivered to Berlin at the heart of the SS-WVHA (SchutzStaffel Economic and Administration Office) by Dr Hermann Pook, SS dentist, who was in charge of centralisation and sending all gold from the camps to the Reichsbank. His affiliation to a criminal organisation and crimes against humanity brought him a 10 year prison sentence, of which he only served five years and nine months. Profits were increased through the rational use of the corpses at the end of those nine months: profits from extracting gold teeth, civilian clothing, money and valuable items left by the prisoners. For each dead body the amount was reduced as a result of cremation costs which were about 2 Marks. There was a direct or indirect profit for each dead body of at least 200 Marks but this often was several thousand Marks. By the end of the nine months this meant an average of 1630 Marks per person and some camps even found additional sources of income through recovering bones and human ashes. 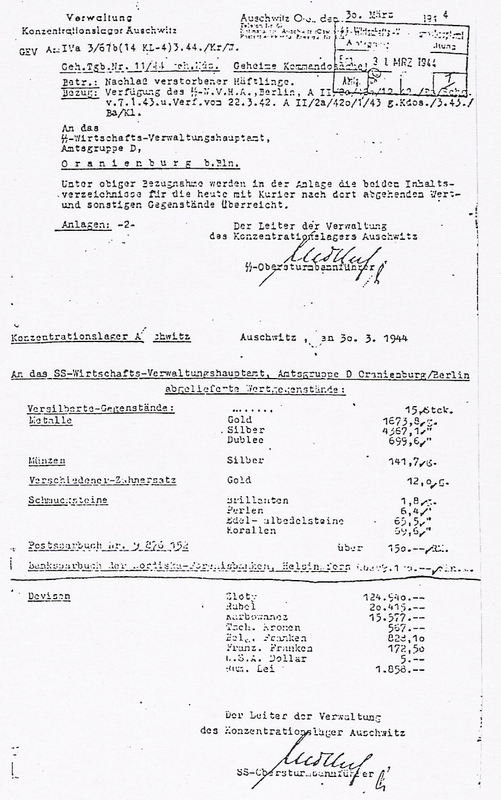 In the summer of 1942, Emil Puhl, vice-president of the Reichsbank, informed Albert Thoms, head of the precious metal division of the Reichsbank, that the SS were ready to send gold, silver, foreign currencies and jewellery . Puhl insisted this was to be a secret and confidential operation. 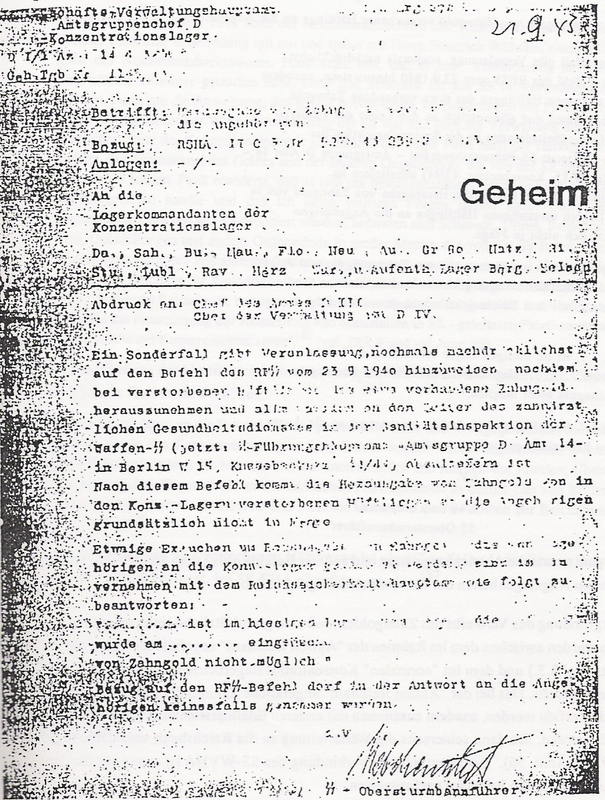 Thoms confirmed to Puhl that the deliveries were to be by truck under direct orders from SS Hauptsturmführer Melmer . The Reichsbank opened a special account in the name Max Heiliger in 1942, following a phone call between SS general Frank and Emil Puhl. 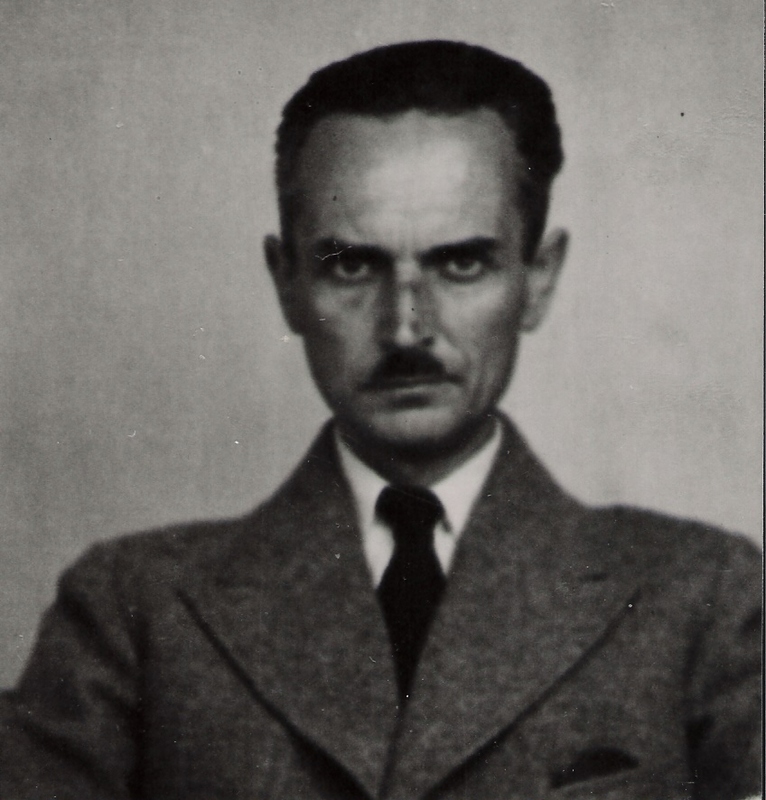 A little later, Albert Thoms had to take receipt of SS deliveries of valuables looted by the SS, which were valued and then credited to the account of Max Heiliger, a fictious person who didn't exist. Melmer made his first deposit on the 26th August 1942. He delivered sealed containers from Lublin and Auschwitz to the bank's precious metals department. A receipt was issued. The first dental gold arrived in the tenth delivery in November 1942. There were to be 76-77 deliveries . The benchmark of the value of gold was related to international trade. All national stocks of gold were accounted for. At the beginning of the gold deliveries in 1942, the gold was made to appear 'pure' originating from the pre-war years. Gold from the camps was reverted back into bullion in the Reichsbank vaults and marked with out of date stamps from 1934 to 1938. On the 8th of May 1940, the Reichsbank opened an account with the national Swiss bank, two days before the Wehrmacht offensive on the Western front. It had been calculated that the value of gold transferred by the Nazis within the confederation totalled 1640 million Swiss Francs according to the national Bank and 1716 million Swiss Francs, according to the Customs Office. Dr Fritz Maede, ministerial advisor, and representative of the Sigmarigen Reich finance ministry was in charge of its transportation from Berlin to Switzerland . All gold bars brought to the cellars were catalogued and issued with authentic paperwork. The Melmer gold, which was not in monetary form, was transferred by the Nazis for 1716 million Swiss Francs. The 12 kg gold bars were stored in a 120 m2 bank vault. Each gold bar was branded with the official Swiss bank stamp, thereby guaranteeing its purity and origin. The exact number of gold bars and their provenance was recorded on a card on the vault door. Once a week, three bank managers completed an inventory. One armed unit from the Swiss army guarded the bank. The German vault opened in 1940 and was located next to the Swiss ones. The vault was opened 110 times to deposit 24,460 bars and 225 times to make withdrawals. In order to pay off the creditors, transfer from one bank vault to another was authorised. By the end of 1942, an estimated 70 to 80% of Swiss companies worked for Germany who paid them with money generated by gold exchanges with the Swiss banks. In 1942-1943, the allied governments were aware of the doubtable true origin of the German gold. They threatened the neutral countries with economic sanctions if they were to continue to accept this gold. The gold trade with Germany was soon to be blocked. Portugal and Spain didn't want any more Nazi gold. A successful embargo was put in place. However, Paul Rossy, vice president of the Swiss bank, had the idea of « transforming unwanted German gold into highly sought after Swiss gold or into Swiss Francs which were accepted everywhere at a stable value . » The German bars were melted down once more and branded with the Swiss bank stamp. Nothing more could now prevent a trade revival. The German imports recommenced and the armed conflict continued. In 1943, Walther Funk admitted that Germany couldn't « hold out for more than two months» if Switzerland stopped exchanging hard currency for its gold . Dental gold has been recovered in extremely organised and precise ways, much like the mechanisms of a clock. If the exploitation of gold has unrelentingly passed through Switzerland at a national level, other lines of exploitation have also existed, including that of the Degussa company. This German company originally involved in the refining of gold and highly profitable today, has had an internal investigation and has accepted its responsibility making the most out of a bad situation, which has made any assessment of this company a very complex matter. This brief introduction should never be seen as the full story and this will be the subject of a book at a later stage. Riaud X (2002) La pratique dentaire dans les camps du IIIème Reich. Paris, L'Harmattan publishing, Germany Collection of yesterday and today: 225-35. Staatsarchiv Nürnberg, Germany (1999) NO-1521. Riaud X (2006) L'or dentaire nazi ou comment le conflit devient source de dissimulations, de vols et de falsification , in Le conflit sous la direction d'Olivier Ménard, Journée de la Maison des Sciences de l'Homme-Ange-Guépin, Paris, L'Harmattan Collection Logiques sociales 219-34. Historia, Les circuits de l'or nazi, septembre (1997) n° 609. Jean-Paul P (1998) Sur la trace des trésors nazis. Tallandier. Philippe M (1997) Or allemand-or allié 1940 – 1945. Revue suisse d'Histoire, Schwabe & Co 47: 520-31. Wilhelm S (1989) Zur Organisation und Durchführung der zahnmedizinischen Versorgung durch die Waffen-SS in den Konzentrationslagern während der Zeit des Nationalsozialismus. Bonn, Dissertation 114-6. Mac Lean F (1999) The Camp Men, the SS Officers who ran the Nazi concentration system, Schiffer Miltary History: 198. Panstwowe Muzeum Auschwitz-Birkenau (2003) Oswiecim Poland. Andrzej S (2000) Die Verwertung der Leichen. Hefte von Auschwitz, Verlag Staatsliches Auschwitz-Muzeum, Oswiecim. Buklijas T (2002) Medical science during the Nazi period: on the lecture by Daniel C. Angetter Treatment and medical experimentation in the Dachau concentration camp. Lijec Vjesn 124: 283-4. Riaud X (2002) Dental Practice in Camps the Third Reich. 102. Joshua G, Kumar S (2000) Témoigner: Paroles de la Shoah. Flammarion. Müller F (1980) Trois ans dans une chambre à gaz d'Auschwitz. Pygmalion/Gérard Watelet: 246-8. 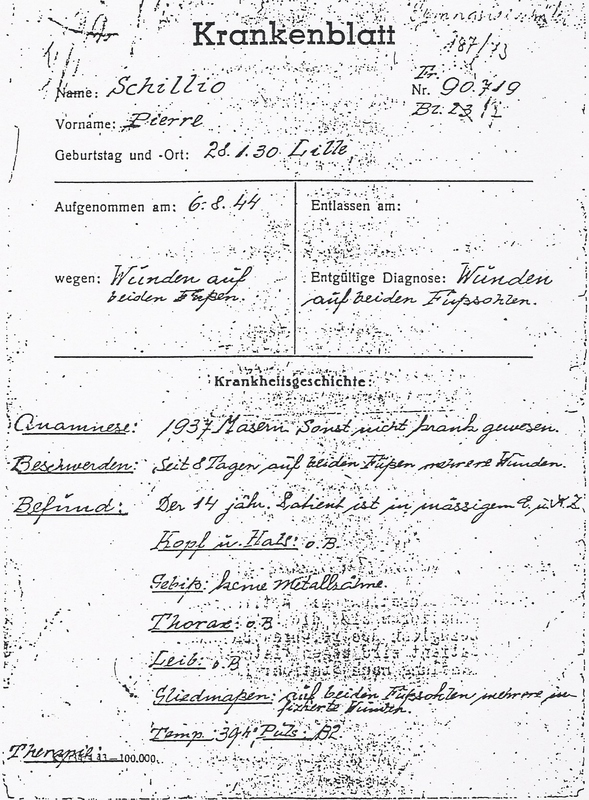 Nyiszli M (1976) Médecin à Auschwitz. Genève, Famot. Centre de Documentation Juive Contemporaine (2002) photo MIX-1-6-15, Paris, CDJC. Panstwowe Muzeum Auschwitz (2001) Poland. Mitteilungen Z (1998) Deutsche Zahnärzte 1933 bis 1945, Köln, 1996 und 1997. Yad Vashem, Jerusalem, Israel: 56. Olère A (1998) Un génocide en héritage. Wern 119-20. ISD-Sachdokumenten-Ordner Mauthausen (1999) Internationaler Suchdienst. Bad Arolsen 43. Kirchhoff W (1987) Zahnmedizin und Faschismus. Marburg, Verlag Arbeiterbewegung und Gesellschaftswissenschaft 105-6. Hauser G (1979) Die Vernichtung der Juden, Munich, Kindler 235s. Bernadac C (1994) Les Victorieux. Michel Lafon. Obadia Y (1975) Pratique dentaire dans les camps de concentration. Thèse Doct Chir Dent. Ziegler J (1997) La Suisse, l'or et les morts. Le Seuil 72-3. Kogon E (1993) L'Etat SS- le système des camps de concentration allemands. La Jeune Parque. Bower T (1997) Blood money: the Swiss, the Nazis and the looted millions, Macmillan. Ziegler J (1997) La Suisse- l'or et les morts. Le Seuil. Commission indépendante d'Experts Suisse (1997) Les transactions sur l'or pendant la Seconde Guerre Mondiale : vue d'ensemble avec statistiques et commentaires. Conférence de Londres sur l'or nazi.